Yash Chopra’s second directorial effort, this film is lauded as a classic, and deservedly so. Set in the years prior to Independence and Partition, it addresses issues like religion, nationalism, prejudice—all topics that are still relevant today, of course! 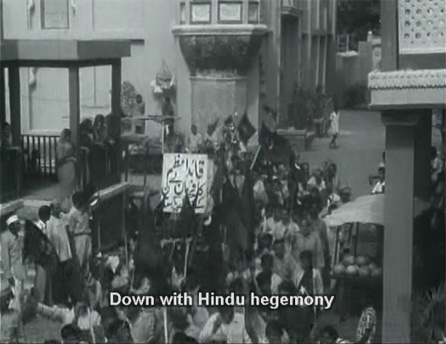 It has a wonderful cast, including Shashi Kapoor in his first adult role (as an insufferable, pompous bigot). 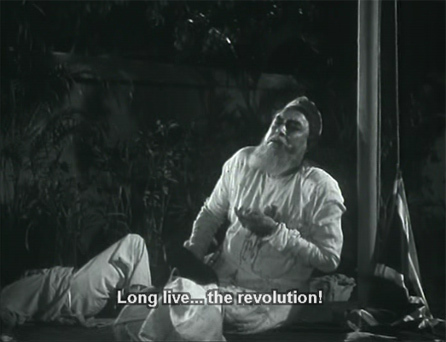 The music by N Dutta is very good too, with words (thankfully subtitled) by the great lyricist Sahir Ludhianvi. The story begins in India under the Raj. 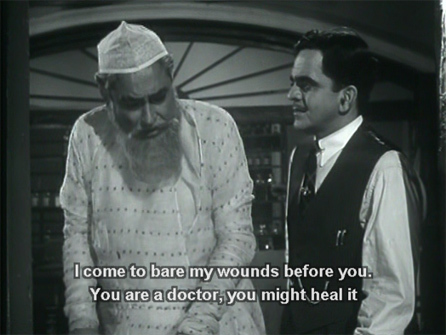 Muslim Nawab Badruddin (Ashok Kumar) comes to his adopted Hindu son, Amrit Rai (Manmohan Krishna—yes, I am still loving on him) for help. The Nawab and Amrit’s father were best friends, and when Gulshan Rai died the Nawab took Amrit into his home, supporting him as he studied medicine and became a doctor. 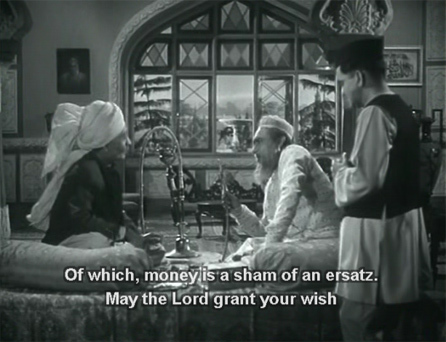 The Nawab’s daughter Husn Bano (Mala Sinha) considers Amrit her brother. She is in trouble (the old-fashioned kind of “trouble”). Her lover, Javed (Rehman) has gone away—her father rejected him as her suitor. Amrit and his wife Savitri (young and pretty Nirupa Roy) agree to adopt her child when he’s born and to bring him up as their own. They name him Dilip and hold a celebration (featuring an uncredited Shashikala). 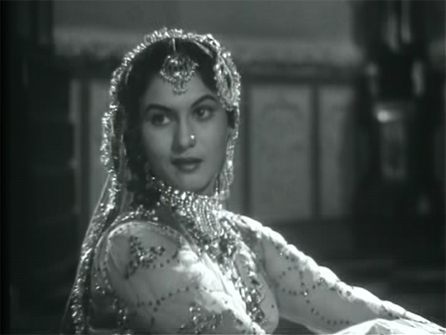 Bano and Javed are soon after reunited and get married with the Nawab’s blessings, and move in next door to the Rais. Amrit builds a bridge between their two houses so that they essentially can live as one big happy family, but even as a child Dilip prefers the company of Savitri to that of Bano (possibly because Bano is a little weepy and—to him anyway—incomprehensibly clingy around him!). Amrit and Savitri have more children—twin boys and then a girl—but Bano and Javed remain childless after she miscarries. The Nawab is killed by the British when he leads a crowd of Hindus and Muslims who refuse to disperse when ordered, and take down the Union Jack to replace it with the Indian flag. After the death of the Nawab, Javed and Bano leave India. The voice-over explains how Hindu-Muslim unity on the issue of Independence panicked the British, who successfully instigated policies intended to set them against each other. As Independence approaches, the country is now divided over the question of Partition, and whether Hindus and Muslims can—and should—live together. As the Rai children grow up, the twins and Rekha (Tabassum) are happy-go-lucky and rambunctious, while Dilip is more serious and immerses himself in religious studies. He’s also a crashing bore (most fanatics are), as his siblings love to point out. When Javed and Bano return after 15 years away, he snubs them, but Bano forgives him and makes excuses for him when Savitri apologizes. Savitri and Amrit want to get him married to the daughter of a close friend. He refuses her sight unseen because she has spent two years abroad; he wants a “good Hindu” wife untainted by Western attitudes. His mother reminds him that women haven’t fared that well under Hinduism. Bano suggests that they conspire to have him “meet” Meena (Indrani Mukherjee—gorgeous!). He falls in love at first sight, just as Bano thought he would. They are soon engaged. Before they can get married, though, the country is thrown into an uproar as Partition is declared. End of digression.) Dilip is now thoroughly immersed in his hatred of Muslims, in spite of his family’s disagreement and disapproval. 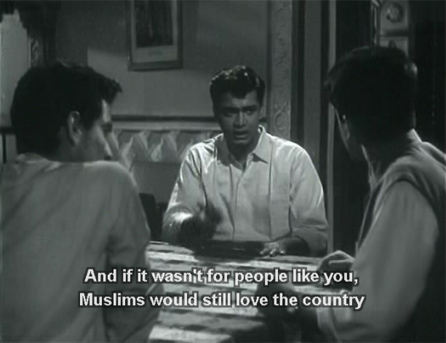 His brother Sudesh (Deven Verma) puts it best. 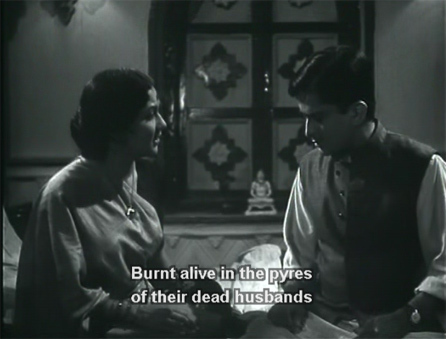 As violence rages, Dilip gathers a mob together and they march with burning torches to Javed and Bano’s house to kill them. Will he discover the truth about his parentage, and his true heritage? Can he accept it if he does? Or will he continue down the path of destruction and hatred? I had only a few minor quibbles with this film. For me, it didn’t ring quite true that a family such as the Rais could raise a fanatic like Dilip. I also wondered why he couldn’t be told the truth at an early age; he was encouraged to think of Bano as his mother—why not just tell him? But they are just little things. The film’s powerful message was thought-provoking and well presented: not preachy at all. It got me thinking about nationalism, and how it’s just as bad as religion in dividing people and setting them against each other, even though that wasn’t a message in the film. But all the rhetoric about who deserved to inhabit India or loved India more made me think of how we are today here in the US. Should love of a country ever override our love for all people, for all of humanity? I don’t think so. I wish our government didn’t either. See how serious I got? It’s the kind of film that makes you think about things like that :-) It’s a far cry from later Yash-Raj films! 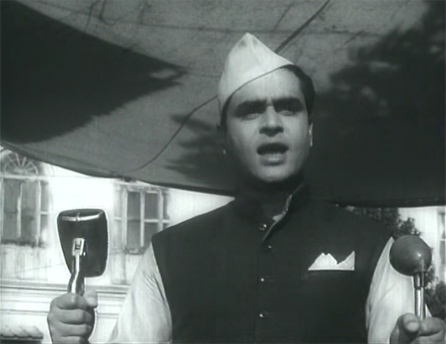 And also, Rajendra Kumar was another (besides Shashikala) uncredited guest performer. 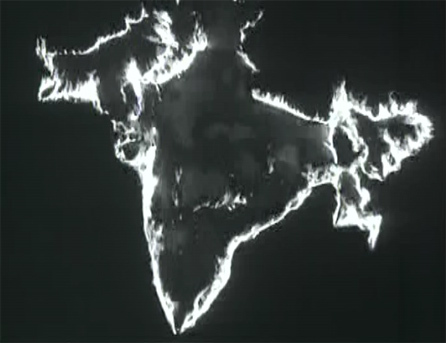 Posted on April 25, 2008 at 2:49 pm in Hindi movies	| RSS feed You can skip to the end and leave a reply. Now that I’ve read ur take on it, I feel ok about not watching it, though it’d b nice to see a young Deven Verma. When did Manmohan Krishna start growing hair in his ears? Because it seems to have always been there! Ah. Young Shashi looks like a big dork in this. Will investigate his bigotry. What a sham of an ersatz he can sometimes be! LOL! I’m quite surprised that you had to link the word “hegemony” with the definition as I thought it’s a very widely-used term – well, at least here in the UK. It’s good to see Nirupa Roy in a different role – she looks so young that I didn’t recognise her at first even after reading the text above. I loved this movie too, inspite of badly portrayed Shashi! He was really, really out of character here wasnt he? :-) But I thought he flashed his megawatt smile too much (especially in the rousing patriotic song) to be entirely convincing! Though i hvn’t seen the movie but after reading this i found interest and will watch it. ppcc: I can forgive the hair in the ears because those big sad eyes are just so beguiling :-) Shashi was not handsome in this for the most part! He really was an ersatz Shashi. 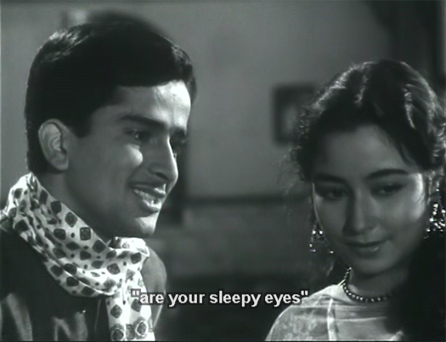 Bollyviewer: yes, great film, bad Shashi—and maybe he was more convincing back in 1961 when people had not seen him in all his Shashilicious glory yet. Sanket: let us know what you think of it! I’m with Sanket on this one. Look forward to watching it. Thank you Memsaab. Hi Memsaab, another great write-up. I haven’t seen the film, though I’ve heard all good things about it. I thought it was Yash Chopra’s first film though! Do you know which one was his first? Also, you had a minor objection about the film, re: why wasn’t Dilip told he was adopted? Well, I think it has a lot to do with the mentality of South Asians. Here, in the States, most people are okay about adoption; but,– I’m from Bangladesh– I’ve a close friend who has adopted a girl and has never told her about it, even though she is nearly an adult now. There’s, sadly, a lot of “stigma” attached to adopted children in the South Asian countries. (I’m not saying everyone feels that way– I most certainly don’t– but there’s many a people who don’t take to adoption kindly). Dhool Ka Phool was his first I think. Thanks for the info re: adoption! Who would ever know from all the kids who are adopted in Hindi movies?! The song “main jab bhi akeli hoti hu” is one of my favs. O how I love such movies! I have not seen this movie. I don’t always want to see films based on books I have really liked :-) But if you give this a try do let me know what you think of it! Memsaab…The man who directed this and many other romantic super hits is no more today… RIP Yash Chopra. Thank you sir for all the happy memories. The man who gave memorable films from Ittefaq to Daag to kabhi kabhie to DDLJ is no more, a shikar of the dreaded dengue mosquito. I liked the movie in its entirety. It has a great message which is relevant even today. Religions have been created by human beings for their own convenience. God did not do that. e all are same. our blood is same. We breathe the same air, drink same water. If Shashi had been told in the childhood that he was a son of Mala Sinha, it would have led to many questions. Why, how etc. It was a secret to cover a mistake and save the family’s dignity. It was not a not a regular adoption. My younger brother adopted one girl, daughter of his brother in law, and she was told about it, in the childhood only when she was able to understand it. Shashi can be excused as it was his first movie as adult. The film changes track in last 20 minutes. So should be watched till end. It was second direction of Yash Chopra. And a great one. There were protests after screening of this movie and it had to be put off screen. After this movie BR films changed the direction of their movies from socio religious to action/romance etc as in Waqt.